This amazing letter came to me from the amazing and artistic Sirpa. 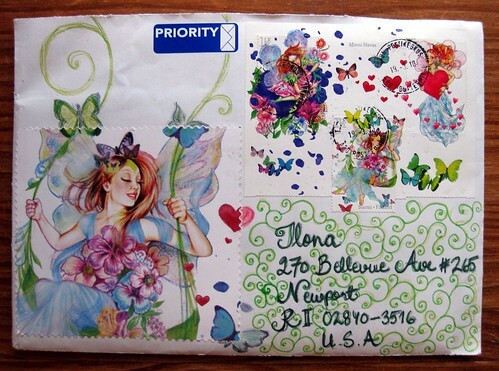 She posted about the Finnish Fairy stamps when they first came out, and I and another blog reader kvelled over them so effusively that she made us both mail art envelopes incorporating these lovely stamps. 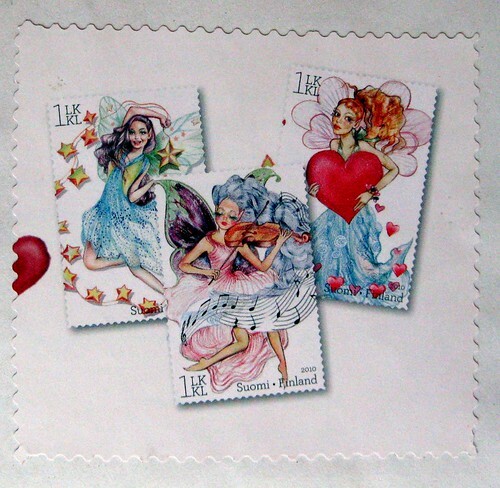 I love how she has continued the artwork beyond the stamps. This photo doesn't do them justice - the stamps each contain a little bit of glitter in them! 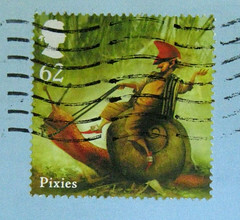 On the back of the envelope she used an image of the stamps from a post booklet. I love this it is awesome . I sent a pkg to canada this am and did not realize it has to have a customs stamp from the post when leaving the usa . Oh well glad that they dont do that for the letters as well . but this is awesome my dear . Those look great! I love fairies and I love receiving things in the mail. Amazing! What a beautiful piece of mail. The stamps are exquisite! Wow, very beautiful. I wish I had even a fraction of Sirpa's artistic talent. Love the stamps and the envelope.